homify 360° invites you today to partake in a journey to the United States. 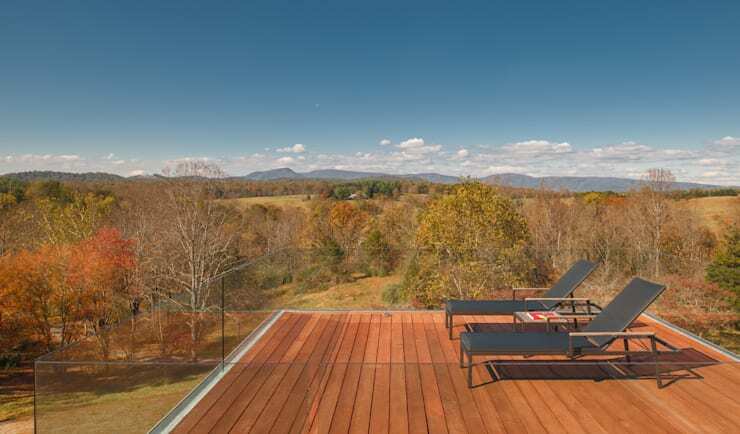 Here, located in Rappahannock County, Virginia, we find the beauty of the countryside. Mountains, grassy fields, clear skies, lush forests – and it is also here where we will discover a countryside villa. But should you immediately start to conjure up images of rustic wood, chipped stone, a sloping gable roof and a rural terrace, stop at once. Although these visions are stereotypical of a country villa, it is worlds removed from the one we are about to see. From architectural artist Robert Gurney comes a modern project that is quite the opposite of any expected rustic residence located in the countryside. 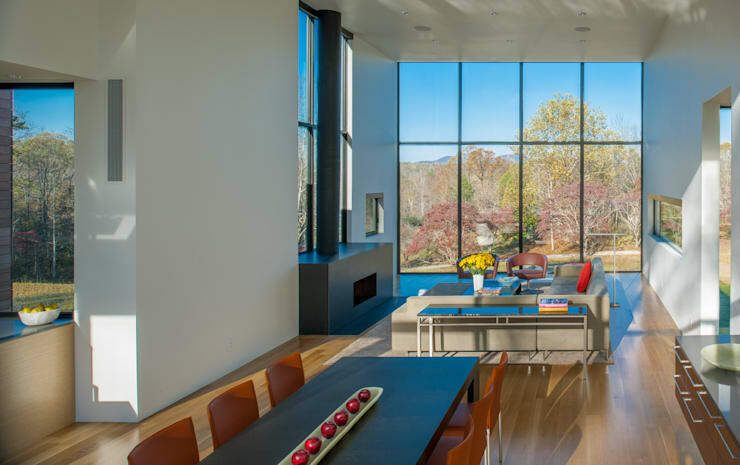 We’re talking glass glazing, modern materials, chic layouts… all elegantly erected in the middle of wild and dazzling nature. But at the risk of spoiling too much, let’s commence our tour. We approach the house from the back, where the leisure area is located. An elongated swimming pool is proudly displayed on the concrete terrace, with volumes of varying heights looming in the background. We see tall rectangles of coated wood, stone, glass, and asbestos cement panels, coated in black. They all rise up like skyscrapers, with an equal sense of flowing harmony and firm stability. These volumes make up the different areas of the house, located expertly to separate the social and private areas, and also to fully make use of that stunning landscape surrounding the residence. Our first though upon viewing the front façade is: “How did the house suddenly get so tall?” Because the structure is located on a slope, the rear side was built on an elevated platform, making the front side appear taller. And if you’re wondering why they chose this particular site for the house, isn't it obvious? The view! From this angle we can clearly make out five distinct blocks that form the house. The isolated one on the very left is the garage. The other four are connected, with the highest one (coated in wood, on the right) sporting three floors – a luxurious suite, a home office, and a private terrace for the owners. Notice the sublime contrast between the natural environment (skies, grass, trees) and designed construction, all linked by an inspiring autumn palette. Time for the inside tour, and we’ll kick off with the gorgeous living spaces. An open-plan area makes up the living room, dining space, and kitchen. The colour scheme chosen for the interior perfectly syncs up with the autumn landscape palette. Browns, beige, greys and reds all flow together harmoniously, creating a visual continuation of the surrounding forest. And let’s not forget about that priceless view visible everywhere in the house, thanks to the floor-to-ceiling tempered glass panels. The house’s ground floor is where we locate the gym, home cinema, and the engine room. On the first floor are the living spaces, as well as a guest bedroom. Two bedrooms are situated on the second floor, but in separate blocks. And on the third floor is where the home office is located, soon to be discovered. There’s no need for the cook to feel lonely in this kitchen; the jabbering of dinner guests at the dining table mere steps away is a friendly companion. 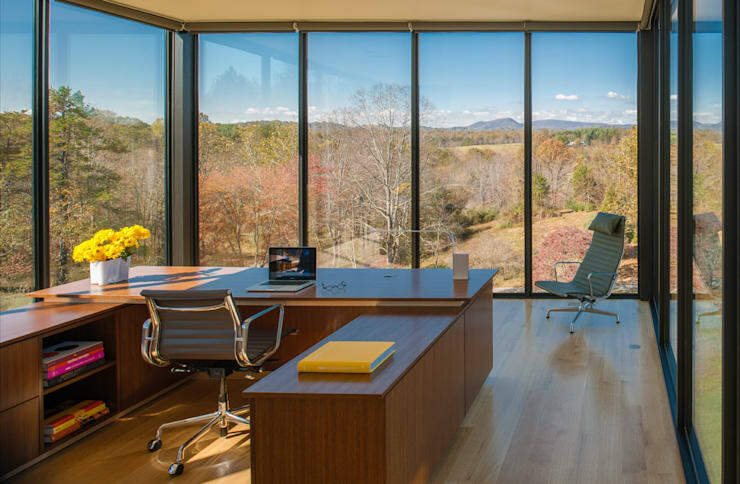 And there’s always that striking view visible through the glass right outside – wild nature, surrounding mountains, and dense woods. If that doesn’t inspire a mouth-watering feast, nothing will! The dining room has been treated to a minimalist design; clean and simple, yet very effective. Minimalistic? Colonial? How about Tropical? Locate your favourite style of dining room right here on homify. The striking features of wood are immediately noticeable upon entering the kitchen. It is the same hue used on the façade, and is a bit lighter than the sandy-coloured tones used for the flooring. A sense of warm cosiness exudes from every corner, adding an enchanting charisma to any meal being cooked here, from a five-course feast to a piece of toast. Even though this is far from a cramped kitchen, it is made even more spacious by that delightful view through the giant windows, adding a touch of sunshine to breakfast. A charming island dictates the end of the kitchen space, with red leather chairs rounding off the warm colour scheme. 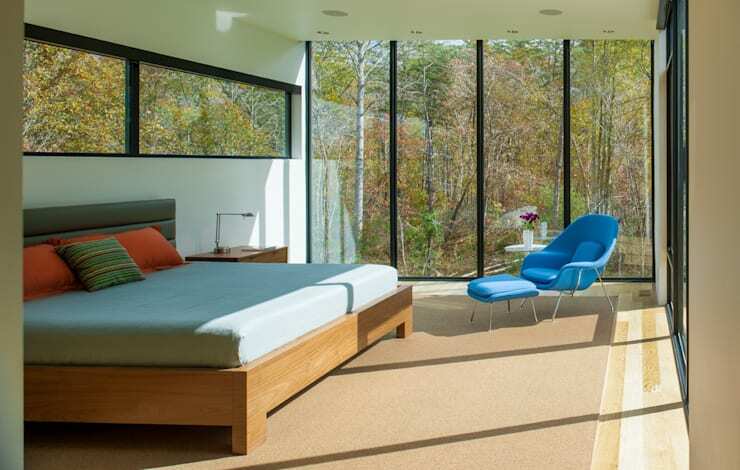 When it comes to the bedroom décor, the minimalist style is in full swing – we already know by now that the real decoration here is the exterior landscape, which gracefully changes each season. The bed has a modest wooden structure, with a green toned headboard that lingers somewhere between moss and sage. Add a bright blue armchair and accompanying footrest, and our colourful chic factors for the bedroom are up to date! We find the master bathroom, elegantly displaying ceramic tiles in neutral colours. No prizes for guessing that the view is the reason that the bath was placed strategically in front of the window. Downlights twinkle from the pristine white ceiling, while lights resembling champagne flutes illuminate the mirror and basin area. 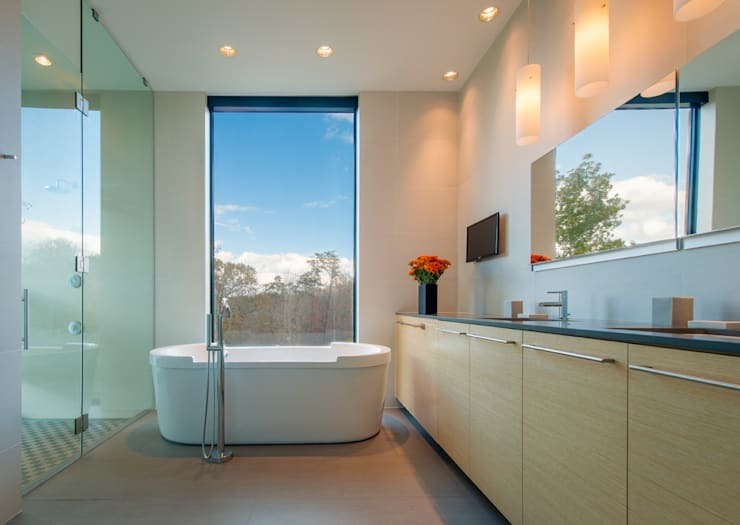 The cabinets portray a smooth and straight line design, highlighting the minimalist décor style that blends in quite enjoyably with the modern architecture. With a view like this, productivity levels are bound to go through the roof here. Purely inspirational, serene and stunning – just what a private office should be for maximum effect. Besides the ever-present landscape view, the wooden desk and cabinets, combined with the sandy flooring, enhance the warmth and intimacy of this space. See some ingenious (yet simple) ways to Perk Up Your Home Office. Beach, be gone – this is the view for sunbathing. Located right on top of the highest block, an open terrace lies in wait. A warm wooden deck holds the comfortable loungers, allowing you to be at peace with your thoughts while enjoying either a coffee or a stunning Merlot. With glass railings for safety and a 360° view for splendour, this open-air environment is the perfect terrace crafted from dreams. The perfect living space... or too bare and open for your liking? Share your thoughts with us!